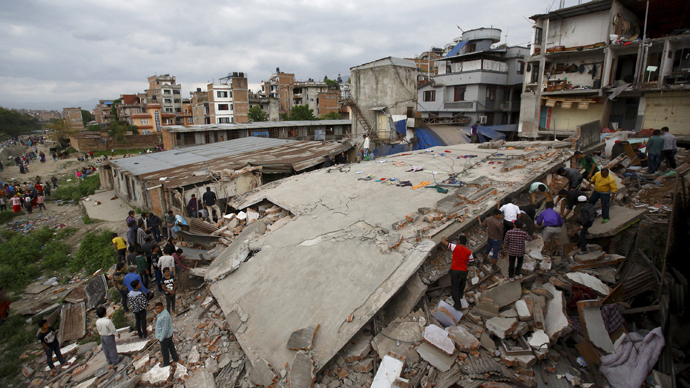 Experts had been warning for years that a serious earthquake would decimate Nepal’s overpopulated capital. Specialists had been trying to work out a contingency plan for Kathmandu, in the event of an inevitable tremor however, they were not fast enough. Saturday's devastating 7.9-magnitude earthquake, which claimed over 2,500 lives, was "sort of a nightmare waiting to happen," according to seismologist James Jackson, head of the earth sciences department at the University of Cambridge. “Physically and geologically, what happened is exactly what we thought would happen,” he told AP. Jackson was one of about 50 earthquake researchers as well as social scientists who gathered in Kathmandu just a week ago to work out a way for the area to prepare for the “big one” they believed was imminent. They just didn't know when exactly it would hit. "Calculations show that there is sufficient accumulated energy, now to produce an 8-magnitude earthquake." Vinod Kumar Gaur, a seismologist with the Center for Mathematical Modelling and Computer Simulation, said in a 2013 interview with The Hindu. "I cannot say when. It may not happen tomorrow, but it could possibly happen sometime this century, or wait longer to produce a much larger one." It turned out it was coming much too soon, for any preparations to be put in place. “They knew they had a problem but it was so large they didn’t know where to start, [or] how to start,” Hari Ghi, a Southeast Asia regional coordinator for Geohazards International, told AP. The main concern was the area's complicated geology combined with its urban area, which was growing too quickly and without earthquake safety standards. The dangers had been felt in Kathmandu before. The previous earthquake in 1934, which was on par with Saturday's tremor, nearly levelled Kathmandu with a 8.2-magnitude force and killed up to 12,000 people. Earthquakes of the same strength can cause widely different death tolls depending on where they happen. The US Geological Survey (USGS) calculates that a severe quake in California would kill from 10 to 30 people per million, while for countries like Nepal a tremor of the same magnitude would cause 1,000 deaths. In China, India, Iran and Pakistan the consequences would be even worse, with up to 10,000 deaths per million residents, according to USGS seismologist David Wald. While earthquakes are natural disasters, the “consequences are very much man-made,” says Jackson, who is also the lead scientist of the Earthquakes Without Frontiers project. “It’s buildings that kill people, not earthquakes,” he added, explaining that "large urban populations are now concentrated in vulnerable places, which is why so many recent earthquakes look like bull’s eye targeting of cities."